Women Rock Chicago | Grandma Runs! The weekend I’ve been planning for is finally here! Several months ago, I saw a post on Facebook about a race called Women Rock Chicago. 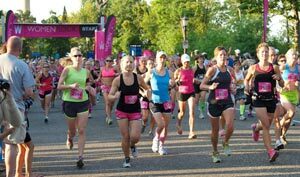 There’s a 5k, 10k, and a half marathon, and it’s a girly race. Because my niece Erin lives in Chicago, and Chicago happens to be one of my favorite places, I registered my niece and myself for the 10k. The route winds along Lake Michigan, which is an amazing place to run. My favorite run took place when I was in Chicago for a conference a couple years ago, and I was able to run along the lake. Having the water on my left and Chicago’s incredible skyline on my right as I ran along made for a memorable run. Gary and I are leaving in the morning. Gary will be driving. If you remember, my girls and I took the *&%^ Megabus to Chicago over spring break. I don’t think I could survive that twice. Thankfully between my sister, brother, and daughter, our house and dogs will be cared for. We will go through the area in Northern Indiana where I lived when I was young, and plan to stop for lunch at Miner Dunn, which is the best burger dive ever. We hope to get into the city before rush hour, and will even attempt to take the bus from Erin’s apartment to the race expo. Though Erin sent very specific directions, I have a fear of getting off in the wrong neighborhood, which could be trouble in Chicago. Lord, help us! The race is Saturday morning. I’d like to say I am ready and expect to run well, but that just hasn’t been the case recently. If you read this blog regularly, you know that this summer I ran 101 days in a row. Once that challenge was over, I scaled my running back to about four days a week, kept up with three to four days of HIIT, and took a day or two off a week. One would think my running would improve because I am rested (at least that’s what I thought), but, in fact, the opposite has happened. I ran much better and felt better when I was running every day. I have been trying to do long runs on the weekends, and got up to eight miles two weeks ago. Gary and I were planning to run the Indianapolis Monumental Half Marathon on November 1, so I was training for that while training for Chicago. I thought I had planned well. My body is not cooperating with my plan. And my knee hurts. Kids: Mrs. Stath, we hope you win your race! Me: Oh, I don’t run these races to actually win. Kids: What? Why wouldn’t you want to win? Me: I won’t win. That isn’t even a possibility. Kids: Well, with that attitude you won’t! Oh…If only it were that easy. One group of boys had me write down what place each one thought I would come in. I have to take a treat to the one who has the closest guess. It is a great feeling to know that I can show them that one is never too old to reach for goals, and that doing my personal best is what really matters. I would like to finish in under an hour. If my knee holds up, my stomach cooperates, and my legs don’t feel like logs, I think I can do it. That would probably put me in the top 20% overall and in my age group. However, if I have to slow down or take walk breaks, so be it. It’s about the experience, right? I thought about not worrying about time at all, and taking time out to take pictures along the way, but once I get into my race zone, I know I won’t want to stop for photo ops. While I am excited to see my niece, to eat Giordanno’s pizza, and have a weekend away, there is a downside to all of this. When I am running Saturday morning, my youngest daughter Addison will be teeing off at the golf regional, which she qualified for this past Saturday. Yes, sign me up for the Bad Mom Award. It’s her senior year, possibly her last golf match of the year, and I won’t be there. As much as I’ve complained about the boredom of a golf match, I hate to miss this one. We made these plans months ago, and as soon as the golf schedule came out, I saw that I would miss, and let Addison know. I am grateful her dad, who doesn’t mind a bit to watch five hours of golf, will be there to cheer her on, and to transport her from the golf match to the evening band contest…yup…missing that, too. So, Good Luck, Sweet Addison! I will be thinking of you as I run! You can bet there will be an ‘after Chicago’ blog post. Until then..Run On!